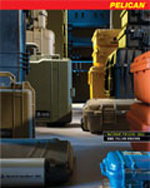 TO VIEW ALL OF PELICAN'S WATERTIGHT CASES PLEASE SEE OUR PELICAN PRODUCTS SECTION OR CLICK HERE. Watertight Pelican cases are watertight, crushproof, and dust proof. An Automatic Pressure Equalization Valve O-ring seal helps to prevent water from entering case. Open cell core with solid wall design make these cases strong and lightweight. Most cases come with Pick 'N' Pluck foam. Personalized nameplate service available. Unconditional Lifetime Guarantee of Excellence from Pelican.